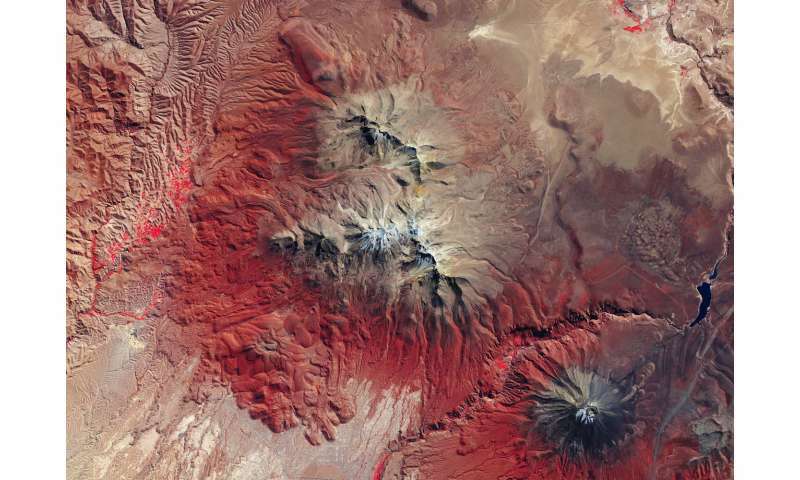 The Copernicus Sentinel-2 mission takes us over the Chachani mountain in Peru. Standing at over 6000 m, Chachani is the tallest of the mountains near the Peruvian city of Arequipa. The outskirts of the city and part of the airport runway are just visible in the centre bottom of the image. The city is home to around 900 000 people and is renowned for its dramatic cityscape, surrounded by three volcanoes. Chachani is shown in the centre of the image. Arequipa is also known as la Ciudad Blanca or the White City thanks to the prevalence of baroque buildings carved from white volcanic sillar stone in its centre. The volcanoes, overlooking the city, naturally form an important part of the city's identity. Heavy shades of red, showing vegetated areas, dominate this false-colour image. The varying tones represent different vegetation types, at different stages in the annual vegetation cycle. The near-infrared channel of Copernicus Sentinel-2 has been used to achieve this false-colour effect. A number of crops are grown in this area, including maize, asparagus and hot peppers (rocotos), which feature in many local dishes, such as the region's signature dish of rocoto relleno. In the centre-right of the image we can see a body of water called Aguada Blanca. This is part of a protected natural area, covering 360 000 hectares. Llamas and alpacas live here, as well as flamingos which have made the surrounding lagoons and wetlands of the Andean plains their home. Wool trade is a huge industry for the region, with artisan crafts also booming in recent years. Sentinel-2 is a two-satellite mission to supply the coverage and data delivery needed for Europe's Copernicus environmental monitoring programme. Sentinel-2's main instrument has 13 spectral bands, and is designed to provide images that can be used to distinguish different types of vegetation and monitor plant growth.